I was glad that LT had suggested this book from the great P.G. Wodehouse collection because I thought it was one that I hadn't read. I started it and everything was sounding so familiar . . . a bank, "coffee breaks", cricket, etc. WHERE had I heard of this before? Anyway, I decided to go ahead and read it again and I enjoyed it - again. This time Wodehouse takes us inside a bank and paints a picture of boring monotony such a life entails (or so it would seem). When young Mike Jackson's family suffers a financial blow, he must take a job in the city working at a bank and learn how to make his own way in the world. His friend and "Comrade", Psmith, offers to share a flat with him and pays some of his expenses on account of the fact that he would consider Mike his personal and confidential secretary. Mike agrees to the generosity of Psmith and as a result is led on many an adventure of Psmith's, mostly in the realm of socialistic circles. I was most entertained by the dinner scene in which Mike is cornered and forced to listen to Comrade Prebble babble on unintelligibly about the Rights of Property. P.G. Wodehouse himself worked in a bank and left it upon finding success with pen and paper. I find this particular book, Psmith in the City, entertaining in light of that fact. Wodehouse, per usual, has an agreeable and witty way of describing his characters and their personality traits. He never paints the entire picture of who any of his characters are. He gives you just enough to paint your own picture of each individual and it is enough to leave you with a smile and a sigh. Anything by Wodehouse is, of course, to be highly recommended. This one included. I'm definitely going to have to buckle down and read both books for this month. I love Wodehouse and really need to go on a reading splurge with his books. Can't wait to read this one! I loved this book, but then I love all P.G. Wodehouse. Thanks Carrie for posting the review on this book. This lovely Bookfest, which is something I so very much enjoyed last year, is not something I've managed to work back into my schedule since changing jobs, and working in my spare time. I haven't read a book since January. Sigh. Glad you enjoyed, even if you had read it previously. 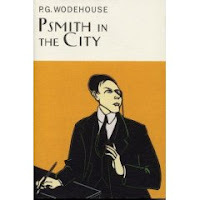 Three cheers for Psmith! I've read other Psmith titles, but I'm looking forward to reading this one. BTW, I've read that he originally tried his hand at writing Western short stories, had no success, and switched to what he knew (English aristocracy), and never looked back. Can you imagine a Western written by a Brit? Maybe it's just me, but I think it would be a scream. Ok--am I the only one who can't find this book? The bookstore doesn't have it. The library doesn't have it. I think I'm going to have to substitute another Wodehouse book for it. Honestly, I had no idea I'd have to donate an arm to find it. Librivox has an excellent audio book of this (for free of course). I'm trying to get your brother to read it, now that he's a banker. I love Wodehouse too so I'll be downloading to my MP3 player, thanks to Stejahen's comment.